Grilling Pork Chops, How To Grill Pork Loin Center Chops. The center cut lies on the loin between the sirloin end and rib end. Center cut chops have a characteristic t-bone shape that is surrounded by the loin and a bit of the tenderloin. Quite likely the most popular cut of pork however many feel the best pork chop recipe is made with the rib end of the loin. The center is very versatile, lean, tender and quick cooking. It adapts well to a brine, rubs, marinades, glazes and when grilling pork chops for maximum tenderness do not cook past medium doneness. Enhanced or seasoned pork is becoming more and more popular in grocery stores in the United States and Canada. If the pork you have purchased is enhanced do not use a brine solution or add any salt to the recipe. Read this article to learn more about enhanced or seasoned pork. This is an optional step, when grilling pork chops brining them in a salt and sugar water solution followed with an optional dry rub will produce a tasty, moist grilled chop. If the pork you have purchased is enhanced or seasoned do not use a brine solution or add any salt to the recipe. 1. If the chops you have purchased are seasoned or enhanced skip step one. For grilling 4-6 unseasoned chops dissolve about ¾ cup of kosher salt or 5-6 tablespoons of table salt and 5-6 tablespoons of sugar in 2-3 quarts (2-3 liters) of cold water in a large resealable bag or plastic container. Let the chops sit in the refrigerator for 1-2 hours in the brine solution, turning the bag or chops once. 2. Remove the chops from the brine and pat dry with paper towel and season with your favorite BBQ dry rub. Allow the chops to sit at room temperature 1 hour before grilling. 3. If using a gas grill first brush the grill with vegetable oil to prevent sticking, preheat on high for 10-15 minutes with the lid down. This method of cooking works best with steaks that are 1 inch or thicker. Scrape the grill clean with a grill brush, leave one side on high and adjust the other side to medium heat. 4. The key to not overcooking a thick pork chop is to sear the chop on both sides. On the high temperature sear the chops about 2-3 minutes on each side with the lid down. 5. Once the chops are browned on both sides, slide them to the cooler part of the grill, continue grilling with the lid down to the desired doneness. For maximum flavor and tenderness cook to medium (145-150 degrees), anything more when grilling pork chops will begin to dry out the chops. When cooking with a charcoal-grill, build a two level fire by stacking most of the coals on one side and the remaining coals in a single layer on the other side of the grill. This works the same way as the gas grill, searing the steaks for 2-3 minutes per side over the high coals and then sliding them to lower heat to finish. When grilling pork chops with charcoal keep the lid open. Because the lid is kept open with charcoal, cover the chops with an aluminum roasting pan or pie plate after they have moved to the cooler side to evenly cook the inside to medium doneness without burning the outside. Sear the chops on each side for 2-3 minutes on high heat, then move chops to medium heat, continue cooking following the chart for the needed minutes per side on the medium heat until desired temperature is reached. Remove the chops from the grill, tent with foil and let rest for 5 minutes, this helps to redistribute and retain more juices when sliced and promote a more even color throughout the meat. The temperature of the chops will rise about 5 degrees well resting, remove the chops 5 degrees before desired doneness. The above times are guide-lines, temperatures differ from grill to grill, do not judge a steaks doneness by minutes per side. You should always use and instant-read thermometer to check the doneness. The above temperatures are per side after the initial searing on high heat. A pork chop ½-¾ of an inch should not be seared on high heat, searing a thin chop will brown the exterior but quickly dry out through the center. If using a gas grill, first brush the grill with vegetable oil to prevent sticking, preheat on high for 10-15 minutes with the lid down. Scrap the grill clean with a grill brush, and adjust the heat to medium-high. Grill with lid down until nicely browned, turn over and continue to grill until the other side is browned. The interior will be cooked through, this method works best with moderately thin steaks. For maximum flavor and tenderness cook to medium (145-150 degrees), anything more will begin to dry out the chops. Remove the chops from the grill and tent with foil for 5 minutes, this helps to redistribute and retain more juices when sliced and promote a more even color throughout the meat. The temperature of the meat will rise about 5 degrees as they rest, remove the chops 5 degrees before desired doneness. The above times are guide-lines, temperatures differ from grill to grill, do not judge a chops doneness by minutes per side. You should always use and instant-read thermometer to check the doneness. Always use an instant-read thermometer to check the doneness of a chop when you first learn how to make pork chops. Stick the thermometer through the side of the chop deep into the meat but not touching the bone or fat. For maximum flavor and tenderness cook pork to medium (145-150 degrees), anything more will begin to dry out the chops. Always let your chops rest for 5 minutes before cutting, to redistribute and retain more juices. 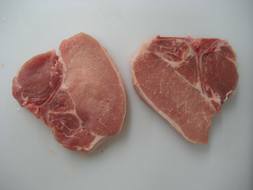 The temperature of the chops will rise about 5 degrees as they rest, remove the chops 5 degrees before desired doneness. To avoid flare ups, trim chops closely, leave only thin layer of fat to preserve juiciness. Turn with tongs or spatula, piercing causes loss of flavorful juices. Sear thicker chops on both sides with high heat, then cook over medium heat, high heat chars the outside before the inside is done. To avoid burning, do not add bbq sauce until the last few minutes to any barbeque pork chop recipe. If using a gas grill, cook with lid down for best flavor, more even cooking and energy efficiency. Keep lid open when grilling with charcoal. Before heating the grill, brush the grill with vegetable oil to prevent sticking. Never place cooked food on the same plate that held raw meats.